I wish I still did story times so I could use this adorable book! In simple statements, the text lists things that begin with the letter B: beads, bananas, basket, bicycle, brother, and Baba, while the illustrations convey the story of a baby who stows away in her big brother's bike basket to visit her grandfather. My three-year-old has just begun to learn consonant sounds and this book arrived just as we were introducing the letter B, so it was perfect timing for us, and both she and her one-year-old sister have just loved poring over the pictures and pointing out the baby each time she appears. I am not always crazy about Atinuke's books, but this one is a hit with me and my kids, and I happily added it to our home library. 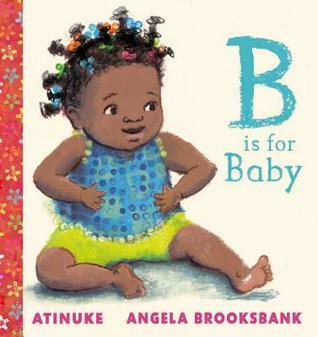 Sign into Goodreads to see if any of your friends have read B Is for Baby.